Every evening at sunset, hear my new piece written for baritone Tobias Cole and James Turrell’s Skyspace. So thrilled to be invited back into the fold of heavenly catholics crew.. I’ve been guesting with this band on and off for many years now, and it is always such an honour playing with jazz heroes. A Hitch to the Sticks Festival warm up party! Join us for a unique musical event, commencing with experimental musician, Natsuko Yonezawa, producing her own soundtrack to Tallagandra Hill wines, live. Then settle in for a special audience vocal experience led by Cara and Jess before the main event kicks off with a home-grown set by local art-pop phenomenon Jess Green aka Pheno and the rollicking folk blues headline act of Hatfitz and Cara. Bring your singing voice and your dancing shoes! HOLY MOLY – Is this TRUE!! ?? I am so excited to play support (along with the awesome Danaides) for USA guitar legend Marc Ribot. I remember the exact moment I clocked this players awesomeness – on Tom Waits’s “Real Gone” I then promptly bought a LOT of Tom Waits and Marc Ribot… he is a truly unique voice and I urge you to see him play if you enjoy creative guitar playing and where Blues, Jazz, Americana, Avant Garde, and Rascal can all go!! SO excited to play with Deborah, Clare, Hannah, Myka & Helen again. Last year’s tour was such a blast and I was so loved up while mega pregnant with Arky. Can’t wait to take him back up North to meet the band. This concert also features very special first nation guests from around the commonwealth. We’re fresh from an east coast tour, including a show at the Brisbane Powerhouse (pictured above), and for the last show of the year and my home town, I have curated a very special evening. Before the show and during interval, you can experience sound designer Annie Mckinnon’s ‘Habitatual’, an interactive sound piece. The first set of music features Annie performing songs as well as Jess’ band mates Alyx and Bonnie, all of whom are wonderful songwriters in their own right. After Interval Pheno Band takes the stage to perform the EP. opeing October 27th in Canberra. Playwright Melissa Bubic won the STC’s Patrick White Award in 2010, and the music incorporates re-working of cabaret and jazz standards, as well as original score – won’t give too much away but I’ve allowed my love of 80’s hits to sneak in, as well as my first crack at writing electronic music! Directed by Caroline Stacey, stars Pippa Grandison (Muriel’s Wedding / Wicked) and features a stellar cast… I heartily recommend! After a lot of sweat, some tears and many trips up and down the federal highway I am finally launching the first single from the forthcoming Pheno EP. As part of the mini tour celebrating the Dragon Year Single Launch, Pheno will play the Saturday night concert as a double bill with Vince Jones. Pheno will also present ‘Pheno Kids Orchestra’ , a special 90min workshop for kids 8-12years old. This concert is a special reunion between old friends, and a tribute to some of the influential composers and guitarists from early on in Jess’ career. Jess has been touring nationally and internationally in a number of musical settings, for many years. For this concert she focuses on her love of Jazz guitar and composition. She will feature the music of some of her ‘Gods‘: Emily Remler, John Scofield, Bill Frisell, George Benson and Pat Metheny as well as her own compositions. The personnel includes Jess Green – guitar, Miroslav Bukovsky– trumpet, John Mackey – tenor sax, Eric Ajaye – bass, Col Hoorweg – drums. Sanctuary is a genre-hopping exploration of musical traditions, from Appalachian folk through classical and jazz, and infused with Indian and African percussion.The work conveys a story of family, kinship, and the lifecycle viewed through the prism of two profound life events: a mother’s journey through Alzheimer’s disease and the birth of a grandchild. It explores themes of acceptance in the face of terminal illness, regeneration and rebirth. 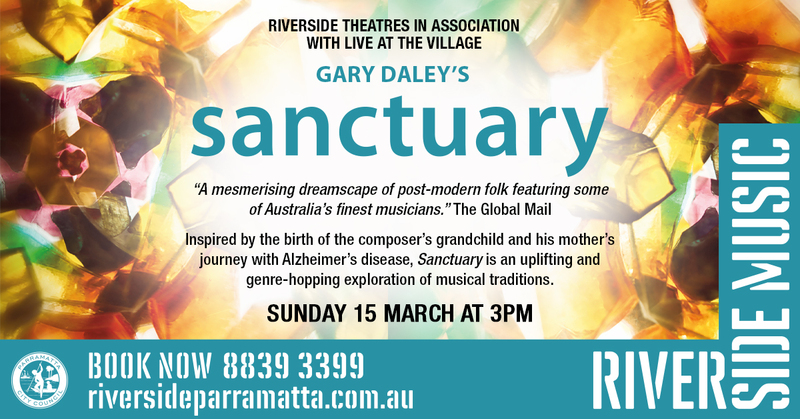 The Sanctuary ensemble’s unusual combination of instruments and stellar cast each contribute their own distinctive personal style into this moving project. We are delighted to bring you this very personal and life-affirming work. Gary Daley (piano, accordion and electronics), Paul Cutlan (reeds), Vanessa Tammetta (violin), Ollie Miller (cello), James Daley (mandolin), Jess Green (guitar), Bruce Reid (pedal steel guitar), Brett Hirst (bass), Tunji Beier (percussion). 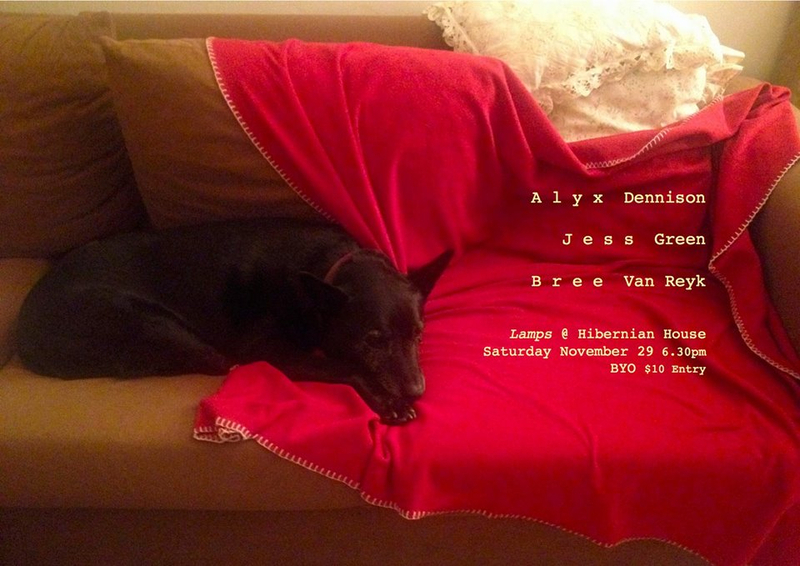 I’m pleased as punch to have been asked by my friend and colleague Alyx Dennison, to play guitar and sing with her to help launch her new album. Alyx and I have been working together touring the Show AM I for the Shaun Parker dance company, as well as other projects. She is an incredible musician, vocalist and songwriter, and this album really blew me away when I first heard it. A very exciting band to be part of, I’d love to see you there! 3pm at the Red Rattler, Marrickville. I’ll be playing with the 10 Guitar Project, as well as a little set of my own new music and a secret set with the dynamic Ensemble Offspring. More Details to come! Please join us for a super casual and fun evening among old and future friends. We will each be playing a little set and maybe even cross pollinating. Who knows what will happen! It will be a night of trying new things! Finally we reunite again since launching our album Just So! Ensemble Offspring presents Sizzle “Minor Works” curated by Bree Van Reyk. Featuring newly commissioned pieces written for, and performed by, a Primary School band! Fun!! These new Minor Works (or rather, works for minors) are currently being written by Paddy Mann (aka Grand Salvo), Bree van Reyk, Jessica Green, andJason Noble, with more to come. It’s going to be very fun, and probably a bit cute, and interesting to see and listen to. And you can eat, and drink, and bowl. Bar open from 7.00 pm. The bar will close after the beginning of the second set. Very pleased to be presenting the pre-loved for SIMA’s women’s jazz festival, come down for some good time party 2-5pm..Zoe and the Buttercups will also be scootin’ they’re stuff what could be a better spring afternoon? if you haven’t caught this re-ignition of an Aussie Icon you must hurry! Jug band, magical Zaniness! Gregory Page (USA) weaves a magical dream-world with his extraordinary tales of love and optimistic melancholy : teetering between tradition and progress, history and fantasy. His mother was a swingin’ jazz singer in 1960s London, and Gregory spent his youth listening to 78s, dreaming of becoming a black American blues singer like his hero Billie Holiday. Hailing from San Diego, Gregory has shared stages with Bob Dylan, Jason Mraz, Leon Russell and many of the greats, filled 1,000 seat venues in The Netherlands and charmed audiences across Australia. He returns to these shores to launch his new album “Shine, Shine, Shine”. Gregory Page’s vintage vocals and shameless love of nostalgia will bring back memories you are yet to have. Intimate, bluesy, vintage, mesmerising, unmissable. at: CAMELOT | NSW | 7:30pm | $25 / $20. what can I say? 10 guitarsists, one drummer, rad compositions!